UbiquitousRat's Roleplaying Dreams: Can you Imagine? Two hobby projects have been gestating this week. The first, Serene Dawn (the SF setting), hit two road blocks which, although largely temporary, put a dampener on my spirits. The second, my ongoing quest for getting fantasy right, opened up new vistas when I re-discovered Imagine. This week the fifth book in the Imagine RPG series arrived at my home: Legends of the Unknown. That in itself was an exciting event, given that the subject matter includes adding watery adventures to the game - think pirates and stuff to do with travelling across the oceans, and you've captured my mindset. The book itself, however, was only the spark for me. The main attraction was to crack open the main rules of Imagine and once again remember both why I love the game... and why I've never been able to get a game with it. Back at the turn of the century, when the world was falling under the spell of D&D 3rd edition and the d20 system was new and magic... there was Imagine. Looking back I see in the creation of this game a proto-movement for what was to become the Old School Renaissance... with a difference. Seeing this, I tracked down the website and bought the game. Reading the rules, I smiled at the irony that the combat roll used a d20... just in a very different way. At the core, Imagine is a d100 game which uses d20 during a fight. The heart of the game, however, really appealed to me... and still does: the game includes a LOT of detail running over a very simple set of core rules. The GM is encouraged to be imaginative and creative, being given all the tools they need (via the GM Guide) to alter or design any element in the game - spells, creatures, classes, items... whatever. The players are also challenged to be creative, but in the way they describe and interact with the world they are playing in. What I discovered was a game which harped back to the feeling I had experienced in the early days of gaming with more crunchy systems but with infinitely more freedom as a GM. Imagine was the first game system I came across which genuinely encouraged me to create a unique world, not just another generic fantasy location. To label Imagine as a reaction to D&D is, however, a mistake. It's also a mistake to lump it in with the Old School Renaissance which (for the most part) has taken things back to an earlier form of D&D. For me, Imagine offers Old School Evolved... or, at least, Evolving. Imagine suggests that, while it's helpful to have classes and levels to map out character power and progress, these things should not be limits to what you can do with the hero. It blends the best aspects of skill-based gaming with the best aspects of level-based gaming... and adds something to the mix. It's not really anti-D&D... it's actually suggesting that you take the game a step further by using your imagination. Imagine makes me pause. It makes me want to try it out. The only problem is that it makes me worry that my players won't like it. It's a game that will take you ages to create a character for but, once complete, will leave you to get on with playing. For my action-orientated group this means it really benefits from a speeding-up tool, like the rough-and-ready character generator on the game's website. What it really needs is a Hero Lab build. It's a game that utilises one of the most innovative combat systems I've ever read. You actually describe what you want to do with that weapon and translate it into an attack roll designed to see if you achieve it. Slashing over arm to hit the Goblins head? Imagine it striking the head if you hit... but striking the shoulder if you narrowly miss! You are not only encouraged to describe (or even act out) your attack but you are rewarded for being clever: how about striking at the throat with your spear, or knocking a sideways swinging blow with your club to sweep the foe's legs out from under him? Imagine is a game which offers real customisation as you grow your hero in whichever of the myriad of class choices you decide to follow. Class is a choice of pathway in adventure... but never a straight-jacket. The only downside is, given all of the choices, the game appears to be pretty complicated. Skills and Saving Throws are rolled on d100, roll-low, with a few optional modifiers. Attack rolls are d20, with modifiers. You gain XP to go achieve Goals (sub-levels) and Titles (levels). Mages cast spells using Aura (read: spell points). Priests cast spells freely but with limits on casts between prayers. Imagine draws on the traditions of fantasy roleplaying. It feels a lot like D&D's spirit infused into a d100 system. Looking at it post-Arduin, I can see an awful lot of David Hargrave in the game... not in mechanics but in spirit. Imaginative ideas, encouragement to create and customise, and alternative ways of doing things are all core to Imagine. On the other hand, on a first reading at least, the game looks like it has some clunky aspects: the second-by-second combat system, for example, seems alien to most roleplayers... unless they've played the new Hackmaster or GURPS 4e. Do I want a game where I need to track the second-by-second moves of the characters? That depends on my desired level of detail: I am sure that some GMs might be tempted to run the game with rounds based on the now-standard idea of a 6- or 10-second round with one action and one move. But if you bother to try out the more detailed system you discover that you don't need to add much more effort to gain a lot more tactical enjoyment... assuming you're into tactical play. Here are two excellent quotes from Imagine creator and CEO, Michael (posted on the forum) in response to me asking, "How do I demo this to newbies?" "For the ease of combat I break [the 10-second round] down into the first three seconds, the second three seconds and the last four seconds...So when the guy who got a -6 [for initiative] goes I ask him what would you like to do? He tells me I'd like to engage this opponent. So I check his movement and see that he has to go from walk, jog to run to get to his opponent in the third second. Lets say he has a 4-second weapon (long sword adjusted). I saw normally it would take you four seconds to swing but you are engaging the guy and you get to him on the 3rd second so that's when your first attack happens." "Tell me how you want to hit the guy. I ask him to either describe or pantomime how he wants to hit. I show him the back of the sheet where we have already pre-calcuated his bonuses to hit and tell him to roll a d20, then add the bonus I have just shown him. Then we see how he hit. Let's say he hit right and said he was going to over head swing at the head. I tell him okay you didn't hit the head but you hit to the right tapping either his shoulder or mine to show and then he and everyone else can really visualize it. We roll damage by the weapon and I ask him what he wants to do next..."
For me, the added appeal is in the detailed description: I can imagine the movement and strike clearly for the trade-off of using a second-by-second, real-time counting system. It's not really complicated... just more detailed. Which is better? "I hit him!" [roll], or "I swing my sword down in a slashing move aiming for his neck!" [roll]. The second description is better, right? But what if that description also matters in the game? Cutting into the guy's neck should be very much more worrying for the guy being hit than just taking another generic dose of hit point damage. Which is more desirable? That is the real question: it is worth the effort to gain that detail? I feel that it might be... but I worry that my players won't agree. Which brings me to the question of newbies. The default assumption is that newbies need simple, for which we often substitute simplified (or, regrettably, simplistic). I have run games of Pathfinder, for example, which use the simplified "Beginner's Box" to intro the game. Thinking back to my own gaming journey, however, I began with RuneQuest and Traveller plus Star Frontiers and D&D. I quickly graduated to Rolemaster. These were not simple games... especially given the appalling quality of explanatory writing in evidence in those early days. 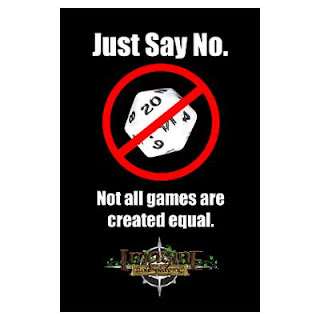 Roleplaying games are not simple to learn to play. They require a certain desire to tell stories and a preparedness to learn some reasonably challenging rules. Most young kids are actually playing much more complex games on their consoles... they just don't have to do the maths because the computer does it for them. But the tactical challenges of the games are quite large... and the more complex the game, generally, the more kids (especially boys) enjoy it. The barrier is their confidence with what they are learning. As with all learning, you need to have the process staged and built in small steps. There's no point introducing all of the rules at once (which I tend to do, even with experienced roleplayers) because you just confuse people and turn them off. Instead, even with roleplayers who have played a lot of games, you need to step-up the learning through play. Enter the demo. Here's where I share a newly developing idea for how to intro a new game: you run a demo. Option 1, probably best for total newbies to a game, is to pre-generate the characters and allow them to pick-up-and-play. Option 2, open to more experienced gamers trying a new game, is to use a quick character generation system to speed them into playing. Either way, you set up some basic situations which allow the players to learn how to use the game to emulate their decisions. The key point here is this: you ask them what they want to do... then you (as GM) model it into the game rules. That's what Michael's post (excerpts above) basically encourages and, from experience, I realise that this is the key. Don't run a huge combat with 20 combatants. Run a quick fight with a couple of easy-to-defeat opponents aimed at teaching the guys how to play. They will learn the basics and get the flush of victory... making them hungry for more. Remember: they're going to win the fight... because the fight is designed to allow them to learn, not to try and challenge the heroes. Run a series of situations which require them to use some skills. The aim, again, is just about helping players to learn how to roll the dice to emulate their actions. Throw in some Saving Throws, sure... this adds spice and danger... and teaches them how to make Saving Throws. Give them choices to make as the story unfolds. Don't write a linear scenario... set up an open situation and allow the players to feel their way through to a conclusion. I'm imagining a house break-in, or a simple cave exploration, or a short street-based investigation with thugs getting in the way. Make it a short session - 2 hours perhaps - and then take them through "levelling up". Allow them to customise their heroes ready for next time. And then invite them to come again... and again... and again... each time, increasing their understanding of the game with a few new details. Even the most complex system, broken down into bite-sized learning experiences, will become accessible over time. The question is whether you're patient enough to create those experiences. I'm going to try an run some folk through games using Imagine. I'm going to design a beginner's scenario set in the world my main group is currently playing in too, just to make the setting stuff easy on me whilst adding to my other GMing commitments. Adding details to the world we're playing in means that, no matter how successful or not my efforts are, they are always useful to my main efforts. I might invite my regular group to test the demo: it's a side-adventure in the setting they are already invested in, so it adds to the background of the stories we're telling... and it allows me to tweak my teaching efforts. Come the big day with the newbies, I'll be all-the-more prepared for how players might react. I'm going to be brave and try to bridge the gap between the detail I desire in my gaming and the apparent complexity it implies. I just hope I can make it work.